“Positivity!” That was the simple tweet from the Chairman of the Ugandan Private Sector Foundation, PSF, Mr. Patrick Bitature, endorsing our programme on Wednesday afternoon. 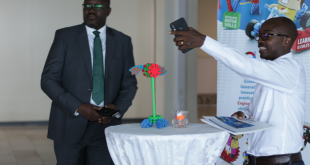 Known for his zeal and a knack for start-ups, Mr. Bitature’s tweet and endorsement as the first ever from a senior Ugandan official could not have come at a better time, when Young Engineers Kampala Uganda is taking the country by storm in championing a STEM Education revolution in the country. Mr. Patrick Bitature is a Ugandan businessman and entrepreneur. He is the founder and chairman of the Simba Group of Companies, an East African conglomerate, with interests in telecoms, energy production, mining, media, real estate, travel, and leisure. He is also the chairman of the country’s top energy utility firm, UMEME Ltd. He once told business students at the country’s top Business school, Makerere University Business School ( MUBS), that there was a genius in each of them. At Young Engineers Kampala Uganda, we are very proud of this endorsement.